Wednesday February 17th 1926 I dressed and went to town before noon. Got me a pair of shoes. Went out to Mrs Peckhams for lunch. Mrs Seth Hart was there. Very pleasant. Came back to the city. Maime came for us. Miss Eavens came too. Letter from Harry Able. 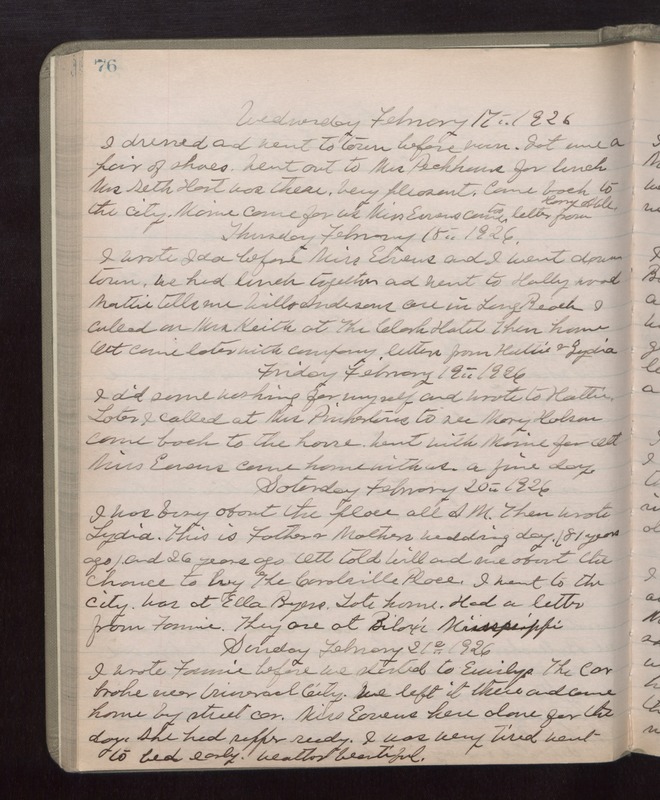 Thursday February 18th 1926 I wrote Ida before Miss Eavens and I went down town. We had lunch together and went to Hollywood. Mattie tells me Will Andersons are in Long Beach. I called on Mrs Keith at The Clark Hotel. Then home. Ott came later with company. Letters from Hattie& Lydia. Friday February 19th 1926 I did some washing for myself and wrote to Hattie. Later I called at Mrs Pinkertons to see Mary Holson, Came back to the house. Went with Maime for Ott. Miss Eavens came home with us. A fine day. Saturday February 20th 1926 I was busy about the place all AM. Then wrote Lydia. This is Father & Mothers wedding day (81 years ago) and 26 years ago Ott told Will and me about the chance to buy The Coralville Place. I went to the city. Was at Ella Byers. Late home. Had a letter from Fannie. They are at Biloxi Mississippi. Sunday February 21st 1926 I wrote Fannie before we started to Emilys. The car broke near Universal City. We left it there and came home by street car. Miss Eavens here alone for the day. She had supper ready. I was very tired, went to bed early. Weather beautiful.